You are here: Home / Articles / Dog Rocks, What are they? Dog Rocks, What are they? I know I was wondering the same thing. What the heck are they and what do they do. I was doing a pet sit for one of my clients and noticed these in a jug of water in the refrigerator with a note attached telling me what it was. So these rocks help to remove the nitrates in your dog’s drinking water and they prevent urine stains on your beautiful green lawns. 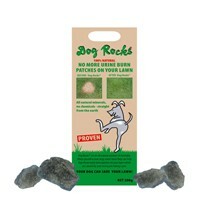 Dog Rocks are non-invasive – in fact all you need to do is put them in your dog’s drinking bowl. I probably wouldn’t advise you to leave the rocks in the water bowls because if you’re dogs are anything like mine they would try to chew or eat them. As the rocks sit in the water, removing any small amounts of rubbish, including Tin, Ammonia and Nitrates. Best of all, while this is happening, the rocks do not alter the pH level of the water or your pet’s urine. Technically speaking, dog rocks are a unique natural remedy for turning your dog’s pee into a fertilizer, and provides a stable matric and micro porous medium, in which active components are made to act as a water purifier instead of an acidic fluid. – you will be giving your dog a cleaner source of water by using Dog Rocks. They do need to be replaced every 2 months. Dog Rocks can be purchased from chewy.com, Walmart and Amazon.com .